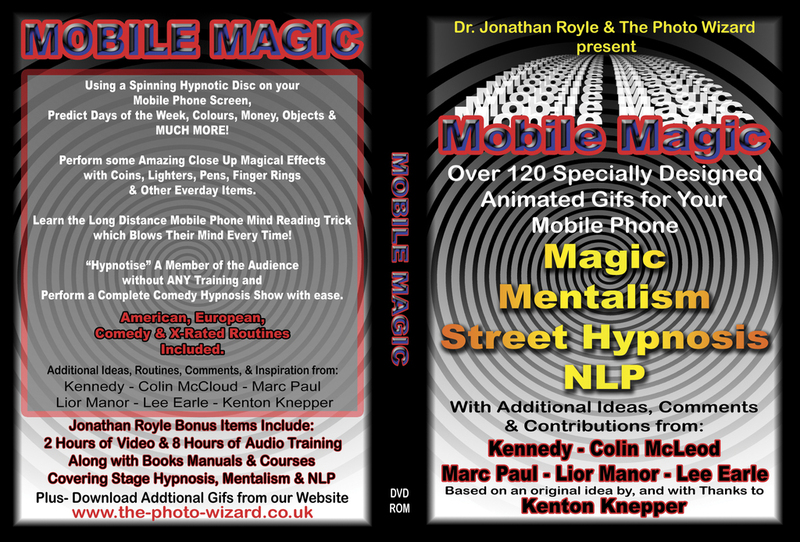 Mobile Magic - The Ultimate Magic, Mentalism, Street Hypnosis and NLP Package. Perform some amazing close-up magical effects with coins, lighters, pens, finger rings & other everyday items making this the perfect anytime, anyplace, anywhere impromptu effect! And as the cover states, using a Spinning Hypnotic Disc on your mobile phone screen, predict days of the week, colours, money, objects and much more! Currencies - Clocks - Watches - Times - Colours - Names - Numbers - Everyday Objects- Playing Cards- ESP Symbols- Pictures - Drawings - Transport - Words - Months- Days of the week - Special Occasions - Zodiac Signs and other unique gimmicked gifs covering most everything you can think of from A through to Z making this an invaluable resource for you! Learn the Long distance Mobile Phone trick, using the spectators own phone which blows their mind every time and has been performed successfully many times by Dr Jonathan Royle both Close-Up and also on Large Stage & Television Shows. Absolutely no pre-show work, instant stooging or similar are ever used in this Miracle Effect! Using the “gimmicks” supplied you will be able to apparently “hypnotize” a member of the audience without any training and perform a complete comedy stage hypnosis show with ease, whereby even those who volunteer to be hypnotized may become convinced that they were genuinely in a Trance even though no genuine hypnosis is used at all! This unique package contains “gimmicks” for every occasion and can be used equally effectively in both close-up & street situations as well as on the largest stage or TV show and yes PERFORMANCE & TELEVISION RIGHTS ARE INCLUDED. Whether you want to perform the Ultimate Dual or Multiple Reality Routines – or perhaps you want to turn the Spectator into the mindreader? – Or maybe you want the ultimate tool for Cold Reading & Fortune Telling Situations or maybe you just want to blow their mind with some amazing close-up magic, in any and all cases MOBILE MAGIC is the product for you! Indeed the package will also teach you GENUINE HYPNOSIS for use in Close-up and Street Situations along with Serious Stage & Mind Therapy Applications which are taught through detailed training videos, audio and training manuals which collectively have sold separately in the past for well over £200 ($400) but they are all included here FREE to introduce you to the world of Royle Hypnosis – Mentalism & NLP Training Products! The Kit includes Gimmicks and Routine Ideas which are suitable for American, UK & European Audiences along with resources for presentations of a Serious – Comedy and even X-Rated Nature! As a SPECIAL FREE BONUS you will also find on this DVD-ROM a total of Two Hours of Royles Hypnotism Training Videos and also Eight Hours of Audio Training From Royle covering Hypnosis and also the business side of making money from Magic – Mentalism – Cold Reading – NLP & Hypnosis. These bonus video & audio items alone usually sell separately for many, many times the cost of this entire package and indeed one of the videos alone teaches you more Rapid & Instantaneous Speed Trance Induction Methods that can be used both on stage, close-up and on the street than any Hypnosis training video currently on the market for magicians & mentalists today! EXTRA FREE BONUS ITEM’S = Also included on this DVD-ROM you will find many specially designed “Animated Gifs” suitable for Mentalists & Hypnotists to use on their Laptops, perhaps in corporate situations and such like.